This year, I have color coordinated my tables. I have placed a basket containing 4 pencils. 4 erasers, and one pencil sharpener in the middle of each table. The numbers will correspond to a bulletin board with art jobs. For example, person #1 may have the job of putting supplies away. The infamous soffet containing my collection of artsy items. We often use these things in still lifes. I always get tons of compliments on this collection. Some of these photos are from last year, but I am going to put them here, since this post is also about organization. I have two ware carts that I really don't use as ware carts because my kiln room is right in my art room. Instead, they have become extra shelves. These shelves are set up for my fifth graders. They keep their sketchbooks in the green buckets (from the dollar store) and their projects on the shelves below. On the other ware cart holds the other grades' projects and supplies for current projects, as seen below. Years ago, another teacher gave me a box of X-ray envelopes. They are the perfect size for holding 12" X 18" projects and visuals. I don't know if you can get your hands on some of these, but they are GREAT! This drawered cart holds the projects I am saving for our end of the year art show. As we finish a project, I save 4 or 5 from each class to put on display at the end of the year at the Arts Festival. 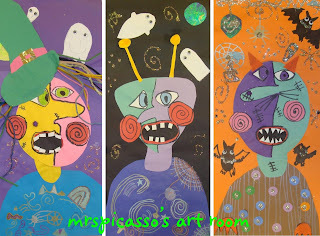 These students become the "Artist of the Week" and I make sure they know that EVERYONE gets a turn. Smaller projects, pieces, and parts go in these drawers. 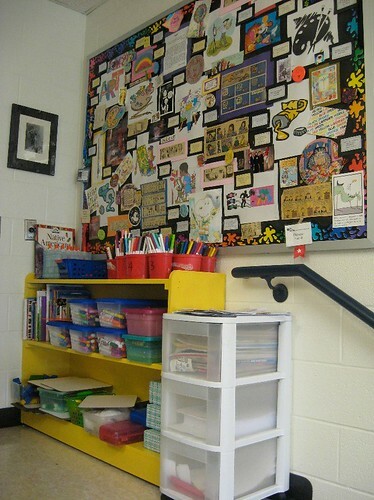 This is the "Free Choice" shelf where the students may choose an activity when they are finished with their projects. Some of the choices include texture plates, drawing supplies, art related books, How To Draw books, building blocks, and the kids' personal favorite- mini whiteboards. This bulletin board never comes down, but things, such as cartoons, quotes, and photos, are added regularly. 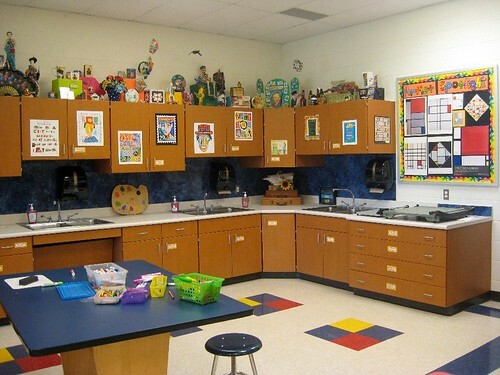 Photo of my classroom from last year. By the way, those tables look really cool, but they are awfully hard to keep clean. This photo shows my word wall and timeline. I have a pointer that I use to show the kids certain words. I may have more to share soon, depending on whether or not I can get those bulletin boards finished. Yikes! Where did you come across the white rolling drawers? I need one of those! Okay I use the number system too for tables only i have the kids get up and get supplies...I have found that leaving the trays on the table doesn't work for me....the kids often touch it and play with things while I'm talking thus not listening or learning anything! What kind of tape did you use to tape down the numbers? do you find that kids pick at the tape? 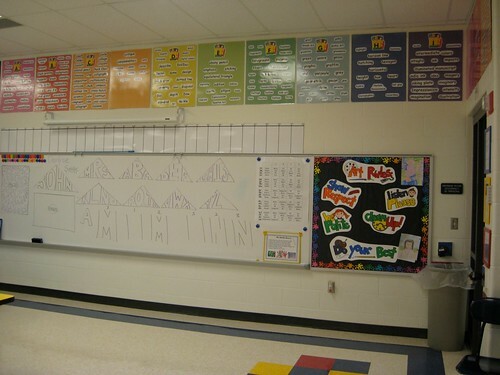 I have numbers taped to the edges around the desk but the kids pick it off incessantly.....At my old school I hung numbers from the ceiling..(this worked like a charm) but at my new school this year the fire marshall won't let teachers hang ANYTHING from the ceiling.... I'd love some suggestions! help! I also have the students get up to get the specific supplies for each project- all except what is in the little baskets. My students are used to this by now, so they do pretty well with it. Also, I have found that if I don't keep a pencil sharpener at each table, I have long lines at the wall mounted ones. I laminated the signs on the table, taped them down with rolls of masking tape, added clear packing tape around the edges, and then put clear contact paper on top. Yes, the littler kids like to pick at them, but most of the kids know better. They know that if I catch them picking, they will be in trouble! I use a color system on my tables (I'll explain more in a future blog post). I have a colored circle on the center of each table. I tried contact paper, tape, clear contact over colored paper, EVERYTHING, but eventually I found the answer. I cut a stencil, and SPRAY-PAINTED the colored circles on the tables. No more worry about kids picking off the circles, or them coming loose when tables get wet after a spill. The number system on the tables is a really good idea. It wont work in my classroom this year, but I will definitely keep it in mind. Thanks! I have my groups colour coded too and each child has a badge that tells them the kind of jobs they will do for that day. It is beginning to work quite well with one year three class setting up and completely packing away in about three minutes- that means 39 minutes of working time in a 45min lesson!! Your class looks great...sigh...I have to share my room with the rest of the school for technology lessons- when I'm not in there and the kids do stuff like glue stuff to my posters with hot glue guns. soon I'll have a new art room- it's in the process of being built and I look forward to it looking a little more inspiring than it does now. Tell me more about your word wall! How is it divided up? I cant seem to zoom in close enough.Thankyou! My word wall is alphabetical. Each poster has one letter of the alphabet on it. I added every art term that I thought we would use in class. Hope that helps! I'm planning to have a free-time area for students to choose an art book, still life object to draw, etc. I'd love to get some white boards for that spot too. How do you balance having fun and interesting things for that spot with students not rushing to get through the project to get to the free area? Also, are they allowed to go over to it only once or more than that? I'm sure my kids would just keep going back and forth from there to their tables if I let them. Well... it certainly is something to think about- how do you make sure students do not rush through a project so they can have free time? I usually tell them from the beginning that their projects are the most important thing and that they will not get free time unless their projects are finished correctly. They must show them to me before they turn them in. Also, some days I just tell them that there will be NO free time that day. That way, they know they must use the entire time to work. I am pretty easy going about them moving around the room, as long as they are not bothering anyone else. By now, they know to fins something and have a seat. They may go back if they wish to change items.